Is it possible to always be in love? It is if you are a part of the paper crafting world! On Saturday April 18, I was apart of another incredible event - The Zonta Card Making Extravaganza. A very lucky 64 participated in this all day event. I say lucky because tickets for this event are getting harder and harder to get. The past two events (one in the fall and this one in the spring) sold out before the early bird date. That speaks volumes....the organizers should be very proud. Above you will see the card I designed for my session. 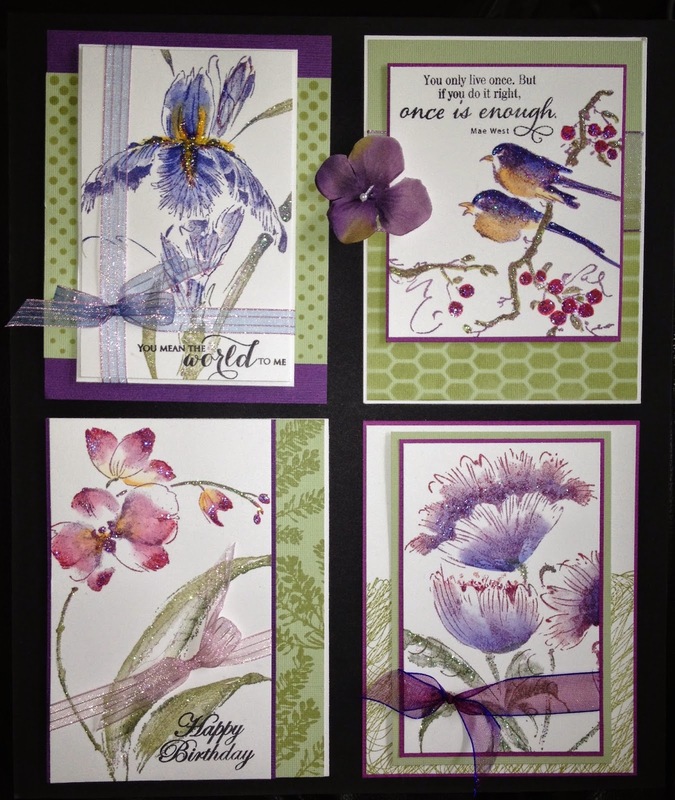 We worked with Prima's watercolor pencils and Penny Black's April in Paris stamp. People were able to choose their own colours. I kept the design very simple and relied on the watercolor pencils to do the work to create a beautiful finished product. So there are 8 participants at each table. We are given 30 minutes to teach our card. My table was a little busy looking but it was colourful chaos and I LOVED it! I don't know if it was because of the long winter, but the card I designed was ALL about colour. No usual kraft paper or my signature twine. Do you ever get like this too? I told the ladies that when I was creating this card, it was as if I "checked" my stress at the craft room door. These watercolor pencils have been so therapeutic for me. To be truthful, regular colouring (with copics, etc.) can be somewhat intimidating for me. I love that I can quickly "colour" and then use the water to "play". Unique results can be achieved on each and every project. This I LOVE.....you should see what I was working on last weekend (pictures to follow in another post). Participating merchants are able to bring products for sale (and what girl doesn't like to shop?). I set up a pretty little table at the event with just a few of my favourite things. I just had to finish this post with a photo I took of these beautiful daffodils in my gold foil mason jar (which I made a while ago). I also brought along a few other watercolor cards. I know you have all seen this girl before, but look how lovely she looks with my mason jar and flowers. I have realized in my older and wiser years that it is all about celebrating the little things that make you happy. THIS makes me happy and I had to share this with you. Don't be afraid or too busy to take a moment to create beautiful surroundings for yourself. Bring out the pottery for your "every day" meal. Cut some pretty flowers and bring them to work to brighten up your space. Sprinkle some of your paper creations around to make you smile. Everywhere I look in my house or office, I see pretty paper. I truly could not imagine my life without it. These little celebrated moments are good for the soul. Well it is official.....I. LOVE. SCRAPFEST. Can you tell? Ha. This photo above says it all and captures the energy of our booth perfectly. Without these amazing girls above, The Paper Pickle's booth at Scrapfest in Kitchener would never have come together as well as it had. I have to say that I have THE best family ever! These girls were there for every minute of the show and I couldn't be more grateful. I am a very lucky girl. Every year, we choose a product to feature rather than bringing the entire store. It is always a product that we have fallen in love with and want to share with you, our customers! 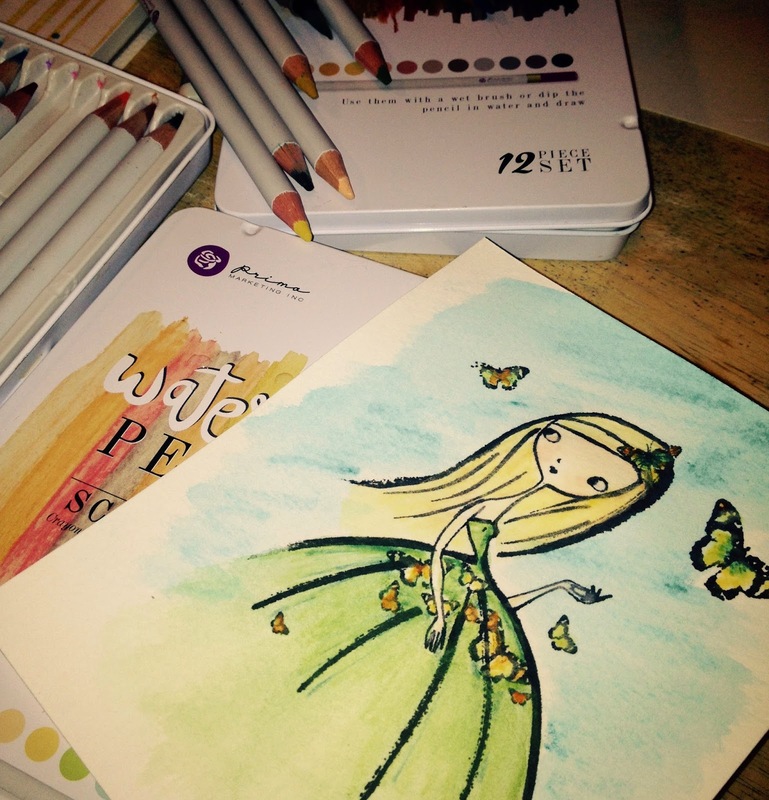 This year we featured Prima's watercolor pencils, paper and water pens. We also had a beautiful offering of washi paper and foil tapes from Little B. You can see how beautifully these gorgeous products filled our booth. Here I am with bigger view of the booth. This is me pre show. Hey, who brought the stiff? Ha. Do I look nervous to you? Nah......I think I was just anxious to get the show on the road! As you will see, we decorated the booth with props and fixtures that stay true to The Paper Pickle's style. We have always been about antiques and crates and rough but gorgeous display items. 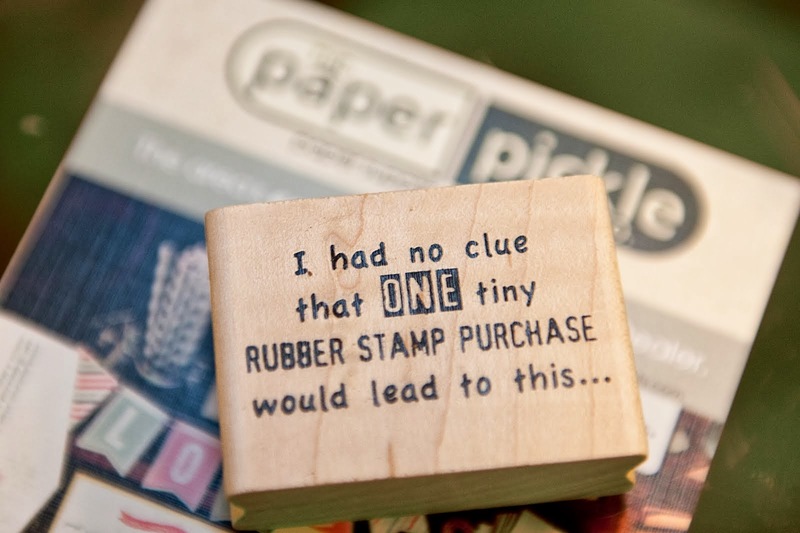 At The Paper Pickle, we know how to find the beauty in everything. Debbie did the most amazing job running our make and take table for the entire weekend. People got to work with our featured products and walked away with a beautiful card. Everyone did so well! That shows we had a great teacher and product that appeals to artist in each of us. This picture catches Lauren in action (bottom left)....Boy can that girl talk! She and Krys were our amazing greeters and chatted with so many of you about our store and why you should stop in if you haven't already. Truly, we would LOVE for you to visit! Everyone is welcome at The Pickle. Here is another view of the booth. I just loved the colourful product amongst the brown wood crates and I had to show you from another angle. Thank you to Krystle, my sister who is a girl of many talents. She is a farmer, photographer (www.krystlevanroboys.ca) and the best pickle sales woman ever. Boy did you guys LOVE our pickles! A big thank you to all of you who stopped by the booth. Your positive comments energize me and keep me going all year long! It is so wonderful to see that the love of paper and beautiful things is alive and well. Well the final preparations are on for this weekend's Scrapfest in Kitchener. I am so pumped! It is such a rush of a weekend. Everyone who attends and exhibits is so passionate about the hobby and this excitement is contagious and energizing. Have a look at the pretty girl above. I was working on a few samples for the booth. This stamp from Penny Black makes me so happy. And those watercolor pencils from Prima? I told my sister that while playing with those pencils, one could not help but be happy and stress free. I sometimes forget how therapeutic colouring can be! And what I really love about these pencils is that you get to "play" with them. Watercolouring allows you to colour outside the lines. The water helps to achieve results that you may not have intended but you know what? It usually makes it better. Happy accidents are always the best when card making! If you are attending Scrapfest (www.scrapfest.com) stop in and show your love for The Pickle! 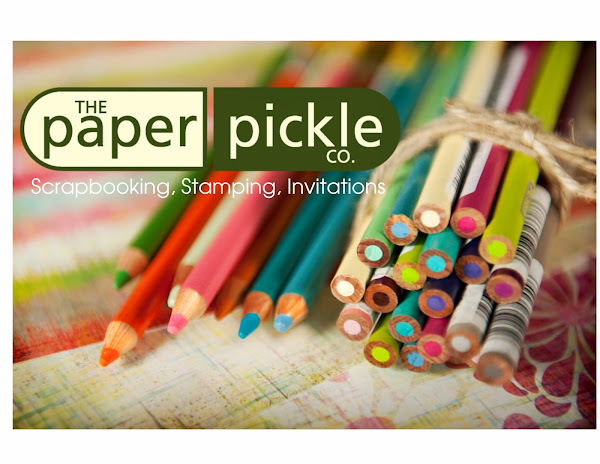 We will be doing make and takes, sampling pickles and of course featuring THE LATEST in stamping and scrapbooking products! We take great pride in our set up and I would love for you to have a look for yourself. Unfortunately there has been a death on Jen's husband's family and the store will be closed SATURDAY, APRIL 11. Your understanding is appreciated. As a few of you are aware, we received a beautiful shipment of Penny Black stamps a couple of weeks ago. I ordered this idea board from the company to show you the gorgeous things you can do with their stamps. This photo does not do the samples justice so make sure you come in and have a look for yourself! I love their brush stroke designs and their watercolour look!